support for single sign-on for dozens of third-party applications, including Microsoft Office 365, Salesforce, Workday, and Dropbox, making it easier for end users to sign into these services and for Apps admins to manage their end users’ IDs and passwords. The process of creating, modifying, and deleting end user identities in third-party applications, however, has remained manual, time-consuming, and prone to human error. Starting today, we’re using SCIM 2.0 to make those processes simpler and quicker for admins. Following this launch, admins will be able to set up automated user provisioning and deprovisioning for Salesforce.com and other apps (with support for more applications coming soon). Once auto-provisioning is enabled for a third-party application, an admin will be able to add, modify, or delete a user in the Admin console, and that user’s info will be added, modified, or deleted from the third-party application as well. 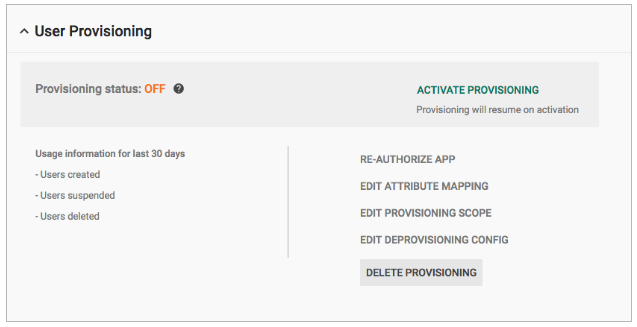 Admins will also be able to check the status of and pull reports on user provisioning for all configured apps. Admins will have even greater control when deprovisioning these apps. For instance, an admin will be able to specify how many days after a user’s Google account is deleted that their third-party application account should be suspended and deleted as well. This configurability will allow admins to remove a user’s access immediately, while also providing them the time necessary to review an account and save or transfer any important data. For specific details on how to set up auto-provisioning, check out the Help Center. In the past year, we’ve launched support for single sign-on for dozens of third-party applications, including Microsoft Office 365, Salesforce, Workday, and Dropbox, making it easier for end users to sign into these services and for Apps admins to manage their end users’ IDs and passwords. The process of creating, modifying, and deleting end user identities in third-party applications, however, has remained manual, time-consuming, and prone to human error. Starting today, we’re using SCIM 2.0 to make those processes simpler and quicker for admins.